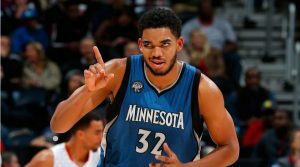 Fantasy Basketball: Reggie! Reggie! Reggie! I remember watching Reggie Miller at UCLA and being mezmerized. Man, oh man could he shoot. Chants of Reggie! Reggie! Reggie! would reverberate throughout Pauley Pavilion. Then, he got drafted by the Indiana Pacers and the same chant was sung. One of the greatest shooters I’ve ever witnessed. He was a career 39% shooter from downtown. At the zenith, he attempted 6.6 while making 2.8 threeecolas per game. Back then, those were amazing numbers. The game certainly has changed, as Steph Curry leads the league with 11 threeecolas attempted with 5.1 makes per game. What hasn’t changed, though, is the Reggie! Reggie! Reggie! chant, only this time it’s for Reggie Bullock. Played 43 minutes in an overtime game. Bullock missed five games due to an ankle injury earlier this month. Since returning three games ago, he’s scored 15, 24, and 33 points and shot 4-for-10, 5-for-7, and 7-for-12 from downtown. Did the Pistons go all Steve Austin on him or something? Bullock is a 40% shooter from downtown, but this most recent heater of 55% is something else. He’s been a top 30 player for fantasy over the three-game stretch without contributing much in any other category! 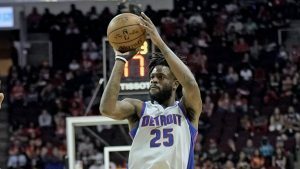 Now, the efficiency is obviously going to come in, unless the Pistons truly did turn Bullock into the modern day, six million dollar man. With that said, he’s been getting a ton of open looks because defenses have to sag down on Blake Griffin and Andre Drummond down low. There will be adjustments, so the volume of threeecolas will come back down. On the season, Bullock is averaging 5.6 attempts per game. Until then, enjoy the ride and chant at the top of your lungs, Reggie! Reggie! Reggie! Muhammad Ali was one of the greatest athletes of the 20th century. At 6′ 3″, 236 pounds, Ali was a physical giant in his era. The average height/weight of a male in 1960 was 5′ 8″, 166 pounds. In the ring, Ali could physically pummel foes into submission like a rhino, yet he was nimble enough to flutter around the opposition and peck them humming bird style. Wait? Why am I making this difficult? He could float like a butterfly and sting like a bee. It was the lyrical flow that unlocked the Pantheon, though. He would talk trash, spit rhymes, and back it all up in the process. Depending on your persepective, it was entertainment or a fly buzzing around your head. Joel Embiid could be the modern day Ali. At 7′ 0″, 260 pounds, he is a giant in his era. The average height/weight of a male in 2018 is 5′ 9″, 195 pounds. Thanks McDonald’s. On the court, Embiid can bully down low in the post or Euro step left and spin cycle right on the perimeter, leaving defenders in a tizzy. Like Ali, Embiid has the lyrical flow, both on and off the court. Man, imagine Ali on Twitter! 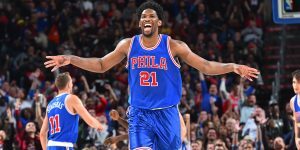 Like Ali, Embiid walks the walk, backs up all the talk, and is the living embodiment of The Process. 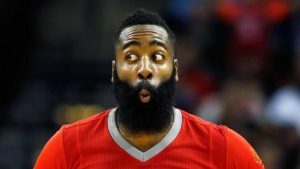 For all the messing around he does, though, last night was the first time he messed around…..
….and got a triple-double. Beep. Boop. Bop. I was wondering why I saw the Stocktonator watching old clips of Ali with Ice Cube blaring from the speakers yesterday morning. It liked Embiid a lot. I enjoy playing poker. Am I good at it? After 30 minutes, I’m still looking for the sucker. Anyways, a common scenario I often see play out is this. Player, which is sometimes me, pushes all the chips into the middle of the table and says, “All you can eat, baby!” Either the chip stack get bigger or said player takes the walk of shame to the ATM. That’s what I thought about the Raptors offseason. They are either making it to the Finals or taking that rebuilding walk of shame. Respect. One game away. That’s how close I was to basking in the glory of predicting a Celtics Rockets NBA Final. Instead, everyone who went chalk, was right. 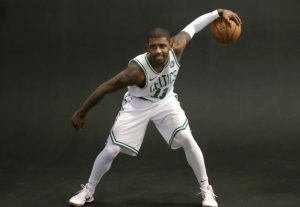 Without being selfish, one game away is more importantly how close the Celtics were from appearing in the NBA Finals. Without Gordon Hayward for the entire season. Without Kyrie Irving for the playoffs. It makes sense then that a team of this caliber, in the Eastern Conference that just lost the best player in the NBA, would stand pat and run it back for the 2018-19 season. With a great combination of youth and veterans, the Celtics are primed for a deep playoff run.